Over the last few months, I’ve become fairly active on Instagram—both through Abort73 and my personal Spieldraw account. As a relative newcomer to the Instagram world, I only recently discovered the niche that engages me the most: hand-drawn lettering and illustrations. I follow an assortment of high and low-profile artists—along with a number of curator accounts that share some of the best hand-lettering projects being posted online. These are my favorite images for the simple fact that I enjoy the quality of work and am always looking for inspiration. I rarely have an “original” idea. It finally dawned on me last week to submit one of my own hand-lettered designs to the Instagram curators I follow. 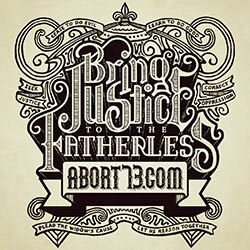 I started with Bring Justice to the Fatherless—knowing full well that the Abort73.com moniker made its selection an extreme long shot. For as much as artists pride themselves on being anti-establishment, they are remarkably pro-establishment when it comes to abortion. The open-mindedness that guides them in other contexts vanishes quickly when the subject turns to abortion. Nevertheless, I submitted my piece on Friday morning and by late Friday night, it had been posted to the self-proclaimed "#1 source for showcasing Calligraphy and Typography." When I checked in on Saturday morning, the Bring Justice illustration had already been liked more than 1,000 times—and Abort73 had a host of new followers! By comparison, the same graphic received only 35 likes on the Abort73 account—in about twice the time. The most likes we’ve ever received is 61 (ABORTION IS LAWFUL), and our typical posts get between 20-30 likes right now. All that to say, I was pretty excited about the early returns! In addition to all the “likes,” our curated post was also prompting a whole lot of comments. These were a bit less flattering. Almost every one was a variant of: Love the design; hate the message—it shouldn’t be here! In fact, when I first looked at the comment feed, there were 18 comments, and not a single one was supportive of Abort73’s position on abortion. In reference to Abort73’s Instagram tagline—“an educational website that is working to protect children from abortion”—one commenter indignantly wrote that abortion has nothing to do with children—it’s only foetuses that are aborted! While waiting for my son’s baseball game to start that morning, I added a comment of my own—applauding the courage of the posters for not bowing to political correctness (indoctrination) and being willing to post an illustration that challenges social norms. Isn’t that what art is supposed to be all about?! I also invited those who were tagging their comments #prochoice to at least spend a few minutes at Abort73.com in consideration of what abortion does to the most helpless members of the human community. When I checked back in shortly thereafter, dozens of new comments awaited, but when I tried to expand and read them, the post would not reload. As the problem continued, I suddenly had that sinking feeling. I was suddenly reminded that life is bittersweet—riding high in April, shot down in May! As quickly as our post went up, it was taken down. The picture, the likes, and all those comments were entirely deleted. I sent off a quick email in search of an explanation and the response was much as I’d expected. The host account pulled the image down because of all the negative feedback they were receiving. Though they “really liked the design and intricacy of the piece,” they posted it without looking at Abort73.com and never expected the backlash that awaited them. They deleted the post in an attempt to quell the drama it had caused. Like most businesses, controversy is something they actively avoid. The tragic irony in all this is that for as progressive as abortion advocates imagine themselves to be—especially artistic ones!—they consistently demand the suppression of any position that questions their own. Rather than allowing a simple Instagram account to function as a neutral forum for the free exchange of ideas, “pro-choice” ideologues clamored for this inappropriate post to be removed. By shaming the hosting account for giving us a platform, the hosts saw no choice but to take the post down. That’s what tolerance looks like in this Orwellian world we live in! Despite my disappointment, I am thankful for the brief but widespread exposure we received and the lessons that were learned. Here are my takeaways. First, Instagram reposts are exceedingly more valuable than likes! Why? Because when it comes to Instagram, far more attention is devoted to the photo feed than the “Following” feed. So, If you use Instagram and would like to help Abort73 reach more people, repost this image (and others!) with the tag, @abort73. Here’s how. Depending on the makeup of your social circle, it’s entirely possible you’ll get some blowback, but it’s also possible you’ll save the life of an abortion-vulnerable child by introducing his or her mom to Abort73. If your devotion to Christ never brings persecution, is it possible that you’re not actually devoted to Christ?